Arrive in colonial Mérida, the capital of the Yucatán, and be met at the airport for transfer to your hotel in the historic town centre. Spend the remainder of the day at your leisure – enjoy a relaxing stroll around this historic town and feel the energy and vibration of the ancient temples that were once here. We start our morning with breakfast together and introductions from our wonderful tour leaders and other group members. We will then check out of our hotel and travel to the Maya ceremonial centre of Ek Balam. According to the sacred book of the Maya, the Popol Vuh, four prophets (Balam Quitze, Balam Akab, Mahakutah, and Iqui Balam) and their wives descended to the Earth from the Pleiades Constellation to share the Maya prophecy. The Pleiades is known throughout the ancient world as a source of wisdom, and since the purpose of wisdom is to raise the soul, Ek Balam can be considered a place of Ascension, hence its other name, “winged figure”. The site is a place where one is given access to the Otherworld and it is here that the Maya Masters developed their spiritual wings to travel to other dimensions, connecting with the future and bringing back through time and space the Prophecies for this time in which we now live. After our deeply moving visit to Ek Balam, we make our way to the Hacienda Selva Maya and Cenote Saamal near Valladolid for lunch and a magical swim. The restaurant is located in beautiful natural surroundings with ceiba trees and abundant native flora and wildlife all around. The natural cenote next to the restaurant is truly breathtaking and the perfect place to feel fully refreshed and ready for the transformative journey ahead. After breakfast we will walk to the renowned Maya site of Chichen Itza. The names signifies “Dew of water that poses on the mouth of the Sacred Well”, and the spirit of the temples at Chichen Itza came from ancient Atlantis (called Tulan by the Maya) through the wisdom of the Master Teacher, Itzamna. Here, Itzamna reconstructed, in the temples and pyramids, the “Maya Cosmic University” where Science, Art, Philosophy and Religion formed a single unit of thought, speech and action. This University was famous throughout Central America and attended by Priests, Astronomers, Mathematicians, Scribes, Artists, Doctors, Teachers, Wise Men and so on. Chichen Itza has more than 2,000 temples and pyramids, each one a library in stone, two magnificent cenotes and its focal point, the pyramid dedicated to KuKuulKaan. After breakfast we will visit the sacred Caves of Balamka'anche'. The cave comprises staircases and offerings surrounding the great limestone column of Balamkanche, stretching from floor to ceiling and resembling the Maya World Tree, Wacah Chan. In Maya belief caves offer a portal to Xibalba, the underworld, where the spirits live with supernatural beings, and the roots of the great World Tree are found. It is essentially a ritual cave where people go to access the Otherworld, returning with knowledge that awakens the latent god within. In ancient times such initiates were called the risen from the dead. Today we visit the site of Uxmal, “The City of Kindness of Mother Moon” or “The Maya Feminine Cosmic University”, its name deriving from “Oxmal”, meaning “three times built”, referring to the main pyramid which incorporates two much older structures. Here at Uxmal women were taught the five gifts of the spirit: Love, Femininity, Maternity, Beauty and Charity. Uxmal is a cosmic university where the Priestesses, Vestals, Astronomers, Artists, Scribes, Midwives and Healers received knowledge from the Master Teachers leading them to become: “Ix Kukuulkaan” or “Women of the Cosmic Knowledge”. These learned Priestesses transmitted this knowledge to many generations in this ceremonial centre dedicated to the Eternal Feminine, Mother of the Earth and Heart of the Earth, on whose roots depend the lives of all who live on the surface of this Holy Land. The site has some of the most beautiful temples and pyramids in all Mesoamerica such as the Quadrangle of the Nuns, the Governor’s Palace, and the Pyramid of the Dwarf of Uxmal. After breakfast we journey to Mayapan, a ceremonial centre which united the wisdom teachings of Chichen Itza, Uxmal and Mayapan, giving it the name “The City of the Solar Shield of the Maya”. According to Maya oral tradition the great teacher KuKuulKaan spent his final years here teaching the Maya his knowledge of the cosmos, constellations, solar system, equinoxes and solstices. KuKuulKaan built a pyramid dedicated to the Sun, to the Solar Logos, and every year on December 21 at sunset on the north staircase the sun projects a figure in light and shadow that appears as the descent of the Serpent to the Earth. KuKuulKaan symbolizes our own inner energy called Kundalini, and the Serpent of Light that appears on Dec 21 resembles a small sun in the Nothern Hemisphere, which will be reborn on the March 21, the Spring Equinox. Today after breakfast we set out to visit two sacred sites: Labnah and Kabah. The name Labnah means, “The Walls of Wisdom of the Mother” and it is an extraordinary ceremonial centre with temples and pyramids the colour red highlighted by a white road, called in Mayan a Zac Be. 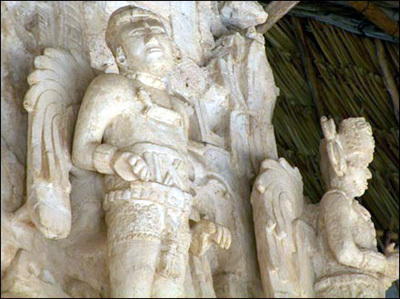 Here the Maya Masters sculptured the face of the Maya Rain God “Yum Chaak” and in the corner of the Grand Palace a sculpture of the Master Serpent of Light KuKuulKaan. Labnah also comprises great palaces and a magnificent observatory, which is like a Cosmic Tower built to admire and track the stars in the sky. The Labnah Arch is a Maya symbol of entrance and welcome from the 3rd dimension to the 4th. In their temples and pyramids still sits the magnificent spirit and profound wisdom left here by the Maya Masters of Light. Symbols and hieroglyphics, some of the meanings still not revealed, await us at this amazing city of the Wisdom of the Mother. Today we check out of our hotel and travel the short distance to the site of Oxkintok for our closing ceremony and tour of this special place. The name Oxkintok means “the place where three suns burn”, and its philosophical etymology leads us to believe that the name is associated with our Sun in the Solar System, the Sun of Alcyone in the Pleiades Constellation, and the Sun Sirius in the centre of our Galaxy. In this very special site you find three stone statues of Galactic Masters who came from the cosmos to deliver teachings on mathematics, philosophy and astronomy. One of the highlights among the many temples and pyramids in Oxkintok is the labyrinth called in Mayan, “tza-zun-tzat”. According to oral traditions, the Maya Masters considered this place to be a portal open to the magic of other dimensions or other places, both within this planet and outside it. There is also a Maya Arch at this site, situated astrologically with the setting of the Sun on the spring and autumn Equinoxes. Oxkintok is a Maya site where the energy of the pyramids transports you to the far corners of the universe, or to the stars, and the only requirement is that you open your heart and mind to the guidance of the Maya Masters of Light and the Sacred Knowledge! Transfer to the airport in Mérida for your flight home, filled with new knowledge of the enduring cultural and spiritual significance of these Maya temple sites. As we say farewell to newfound friends, we leave with the assurance that our own inner journey of transformation will continue, and the wisdom teachings of Freddy and Miguel Angel will resonate with us for years to come.